Getting used to working again has been rougher than I imagined, especially because I am now working the graveyard shift. The hours are midnight to 8 a.m., which actually work really well when you are also trying to run a small farm. The biggest challenge is sleeping while trying to have something resembling a life. As with many things in my life, this is a work in progress. But there is much to share and catch up on, so let’s go! When they offered me the job back in late April, I had let them know that there were a couple of long weekends in June that I would need off. One, of course, was Black Sheep Gathering (more on that later). The other was planned by Kid the Younger as my birthday present. He sent me down to Southern California to visit with Sweetie’s sister and her little family. I have talked about getting there for ages, but it never quite made it to the top of the To-Do list. No more excuses! I drove over to his place in Eugene on the last Thursday of May and he drove me up to the airport in Portland and off I went. Sistah collected me at LAX way past her bed time and I finally got to see their sweet little house, complete with guest house. I wish I had thought to take a picture of the bounty of hand-knit stuffed animals my Wonder Niece had decorated my bed with! All were created by her; she goes to a Waldorf school and at the tender age of 9 is already a wonderful little knitter and a budding spinner. 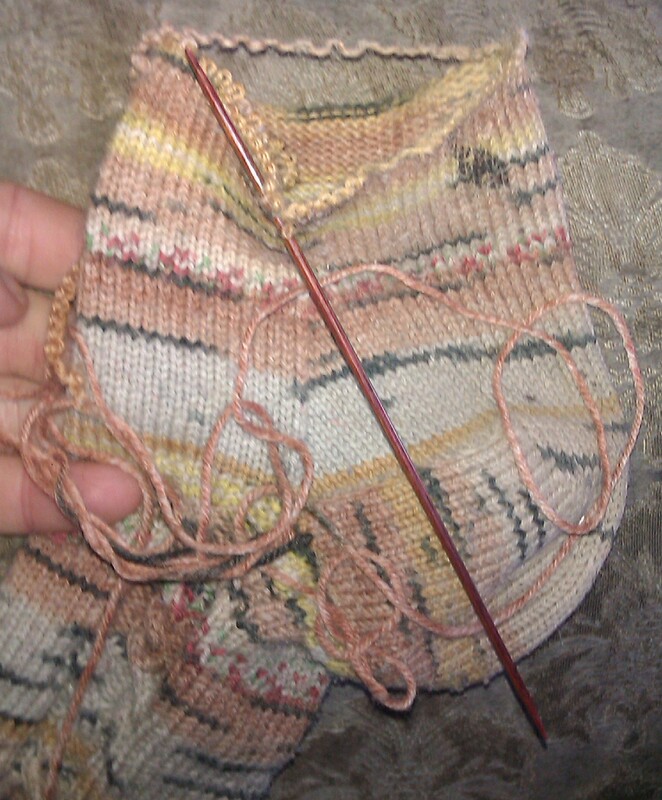 My traveling projects were a pair of socks and my Golding spindle with the yarn I am making for a wedding shawl. When WN asked if she could try my spindle I said sure, figuring I’d take off what she spun since it needed to match what I was doing. A quick lesson in how to handle combed locks and she was off and spinning like a champ. I really can’t tell where my single leaves off and hers starts, so it will all be incorporated into the shawl. I had a wonderfully relaxing time. 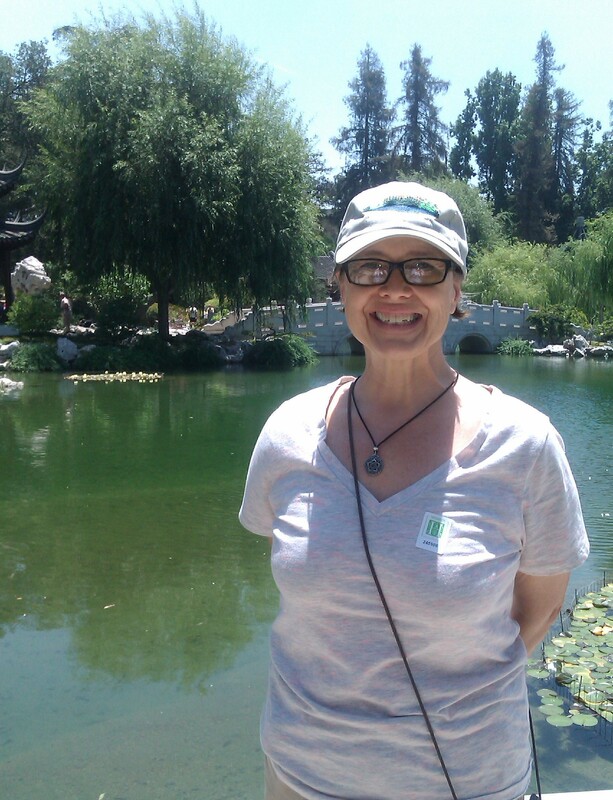 Sistah and I visited the Huntington Gardens on Friday, walking about 3 1/2 miles. I was threatened by a bunch of teenage geese when I wanted to use the bench they were sitting by, but I won the battle of wills. We did a whirlwind tour of the artwork too. Saturday we visited a local yarn shop so WN could pick out some yarn that I could make her a pair of socks from. Sunday some other cousins were in town, so we had a mini family reunion and I finished off the day swimming in their pool. 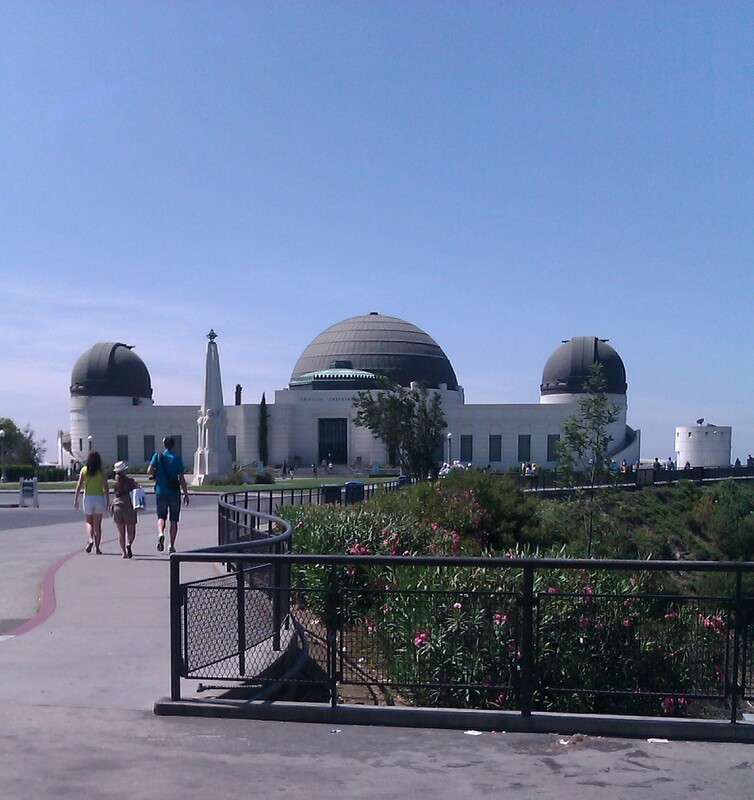 Monday I was headed back home, via a quick trip up to the Griffith Observatory (closed for the day) and then lunch at the beach. All in all, a perfect vacation! I must have come home looking refreshed, because for about 2 weeks afterwards all the store clerks I dealt with called me “Miss” instead of the usual “Ma’am”. The trip home was a bit stressful; my plane was an hour late leaving LA and then hit head winds, so I was a bit late to work that night, but it couldn’t dampen my spirits. Southern California has a special place in my heart. I was born in San Diego and finished high school in La Habra. It was nice to be back for a visit. The back yard was perfect; orange trees all along one side, the pool glistening, a Meyer lemon tree against the side of the guest house. We could not have ordered better weather. Even the smog I remember from when I lived there is (mostly) a thing of the past. While I was off relaxing surrounded by love, Kid the Younger, his Fiancée, and their roommate came and worked on my house! I came home to a much cleaner kitchen and dining room. I have found a few things missing, but their efforts were greatly appreciated. Before I left, one of the brown ducks had indeed escaped again from the pen, and when I found where she was hiding I discovered an established nest. The weather had warmed up enough for her to be successful if she persisted, so I gave her a chance. The nest was in the middle of an old roll of chicken wire, so I hoped that she would escape being noticed by any possible predators long enough to hatch out her brood. 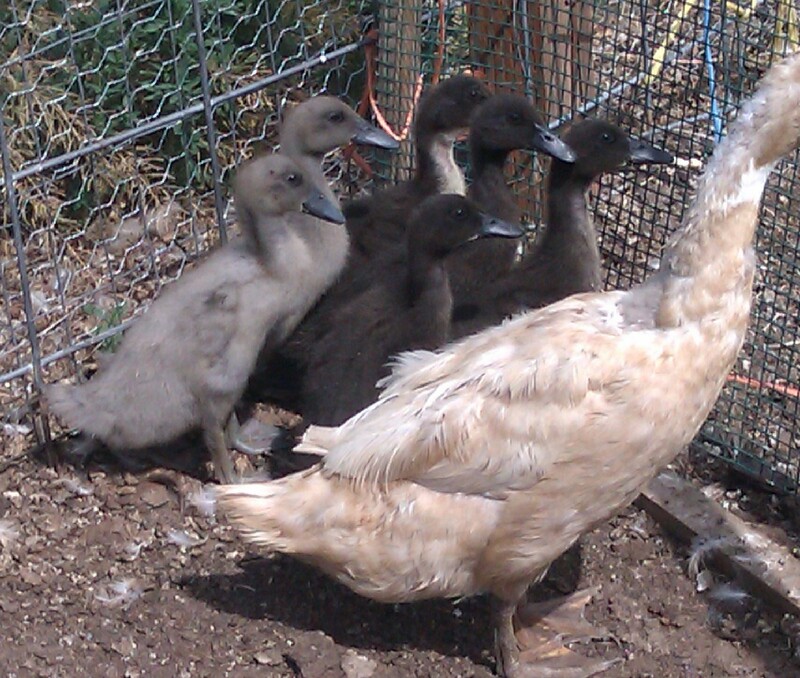 After 30 days, she presented me with 6 healthy ducklings Here they are a month later, growing fast. I set up a nursery area in the corner of the duck pen using my skirting racks. 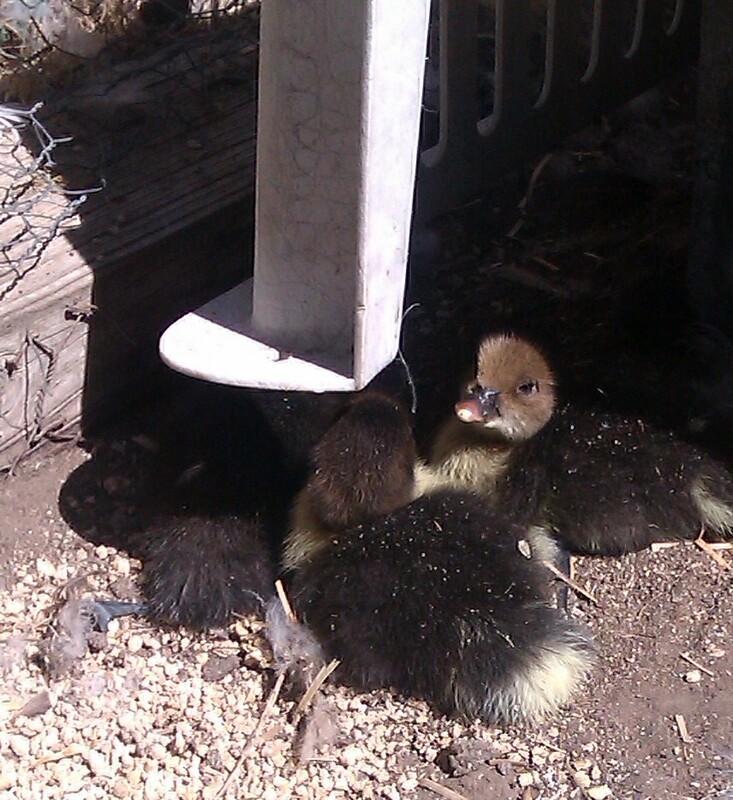 I have since released them into the general duck population, since I needed the panels for a nursery area for the Muscovy in with the chickens. 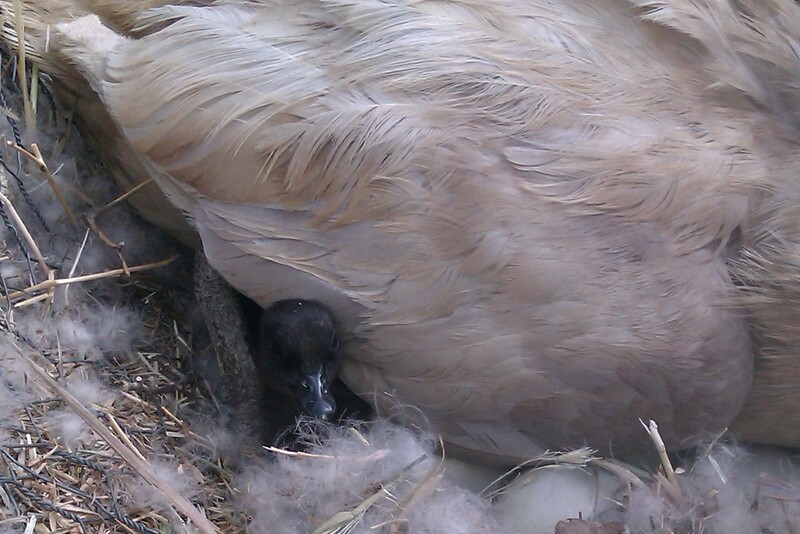 Yesterday she hatched out 8 of her own. Black Sheep Gathering was wonderful as always, with a few bothers. The Romeldale show went well, as did the Spinner’s Lead. There were, however some rather disturbing reports from both the wool show and a class. I have not been able yet to track down which teacher it was, but apparently the people taking the class were told that the CVM breed came about when the wagon trains came across the country and allowed their sheep to breed with the Big Horn Sheep. Yikes! And the wool judge (Judith MacKenzie) wanted to perpetuate the myth that CVMs and Romeldales are 2 separate breeds and any fleeces labeled with both names should be disqualified from the purebred class. It’s bad enough that many judges want to say that fine wools are tender because they will break if handled too roughly, but it is very harmful when a supposed expert doesn’t even have the facts straight. Next year we are hoping to celebrate the 100th anniversary of the breed, with special demonstrations and classes, and I’d love it if all the entries in the Spinner’s Lead were made from Romeldale yarn (there will be a special prize for the best one that is). One very nice thing that I have discovered is that, since the kids are still nursing, I can forego milking for several days without any real drop in production. Even being gone for almost a week didn’t make a real effect. It is nice to be able to take a break now and then. And with a trip to the State Fair coming up towards the end of August, weaning will be put off for a while yet. I’m sure I’m forgetting something, but it will come to me later. I’m hoping to check in again soon. Until then, stay well! Life is change. I know that, but that doesn’t mean that I always appreciate it. Over the years I’ve had too many changes imposed on me, with no say in the matter and while I can work with necessary change, change simply for the sake of change irks me. At my old job, they would often shift our desks around simply because they could, and I always objected. Things around here are changing too. Some of it is good and necessary. Some of it is annoying. I will spare you pictures of the crap-tastic pallet and recycled wood fence I built by the pole barn. One of the neighbors (I’m assuming the idiot next door) had complained to the County, even though nothing had changed in over 12 years. I have a feeling that he thought that after Sweetie passed I would sell off and move, and when that didn’t happen he decided to stir the pot. I got a letter from the County about 18 months ago, with a “solid waste” complaint. When I called to ask about it, I was told that the dead cars in the yard had to be removed, and my pile of trash bags. I don’t have regular trash service; I just make a dump run as needed and it was about time for another. So, dump run accomplished and dead cars removed (3 sedans and 2 pickups), I went about my normal life. Until early this summer, when the Sheriff showed up with a summons. He informed me that I would have to pass inspection, which would have been good information to have from the get-go. Again, I asked for specifics on what needed to be done to make them happy. This time I was told that there was too much “stuff” on my front porch, and that would need to be cleaned off. What an adventure that was! After going almost 30 years without being stung by anything, I was stung by paper wasps 5 times. Each reaction was worse than the one before, so now I’m a little paranoid about being stung again. I called for my inspection. The County guy ignored everything I had already done, and decided that my pole barn needed to be completely cleaned out, or a sight-obscuring fence needed to be built. Argh! How hard would it have been to tell me that in the beginning. It was now the heat of summer, and I was unwilling to risk any more wasp stings. Luckily, I was able to convince him that I needed an extension until we got enough cool weather to quiet the wasps down, and I was able to get enough of a fence built to appease him. Once that was out of the way, I started looking at my front porch. A hole had developed in the decking at the top of the stairs, and I obtained enough decking to replace all of the floor. Unfortunately, it has developed into a much more complicated job. After looking at it carefully, I’m not sure how the porch is still standing. Turns out, there is no real structure under it, only piles of wood that are holding the deck up in places. The posts that hold up the front end of the roof over the porch aren’t even attached to the porch, just resting on it! So that means that I will need to tear the whole thing down and rebuild it from the ground up. Times like this are when I miss my dad; he would have been a big help in doing the job right. Oh well, at least he trained me well. The freezer will be getting new residents in a couple of days. 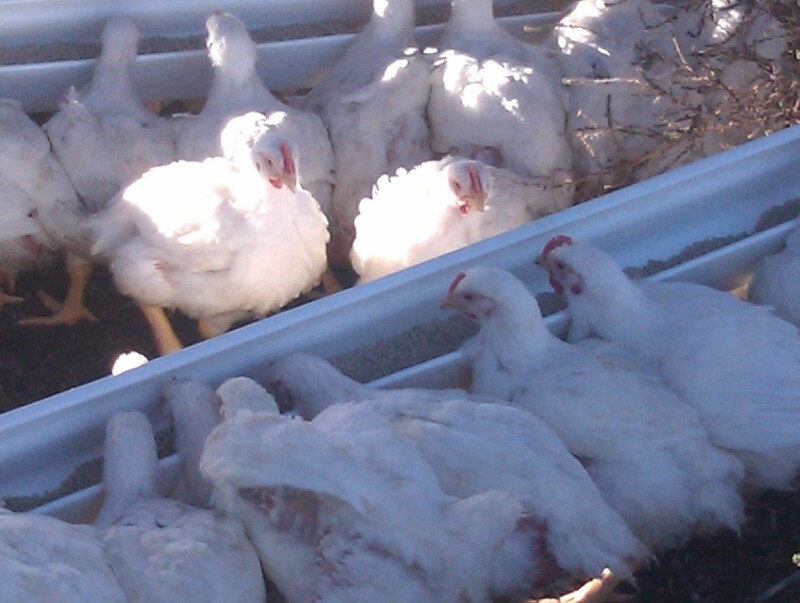 In early September one of the feed stores I deal with got in a bunch of chicks. I got 40 Cornish cross chicks to raise and share with Laura. I brooded them in half of the barn, then moved them all outside to a spare pen. Up until last week I’d done a great job, without a single loss. In a week, I have lost 5 of them. It is frustrating to put all the work and food into them and lose them so close to the end, but the remaining ones are looking mighty tasty. They take their trip to the butcher on Saturday, so hopefully they’ll all last that long. I know other producers can have losses up to 30%, so mine aren’t too bad in the grand scheme, but it’s hard losing them this late in the game. I’ve been working at the carder too. I’m slogging my way slowly through the commission alpaca fleeces, washing fleeces while the weather is being cooperative. 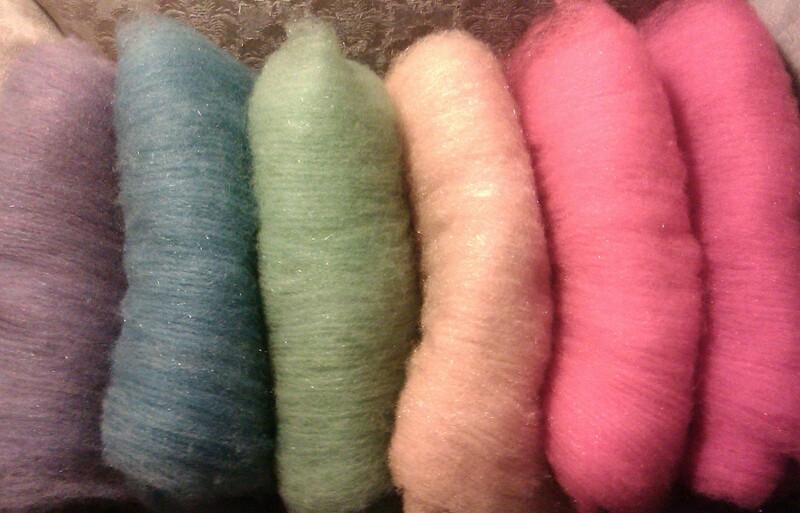 As a break from all the natural color, I carded up some rainbow batts from some leftover Romney cross fleece. I did each of the colors separately, adding in some sparkle. 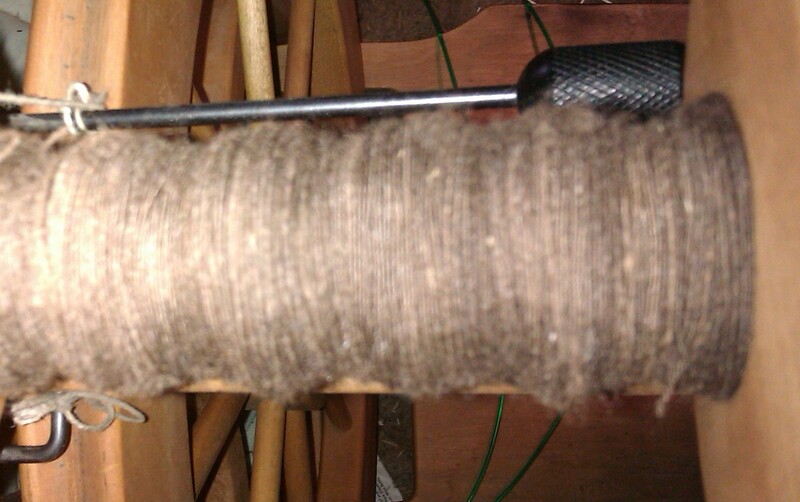 Then I split them up and thinned things down for another trip through the carder. I’m really happy with how these turned out. They are very cheerful in person. Three of them are being bartered for a Christmas present, but the other 6 will be sold if I can resist spinning them up myself. The pictures don’t do them justice. I’ve been knitting on socks. 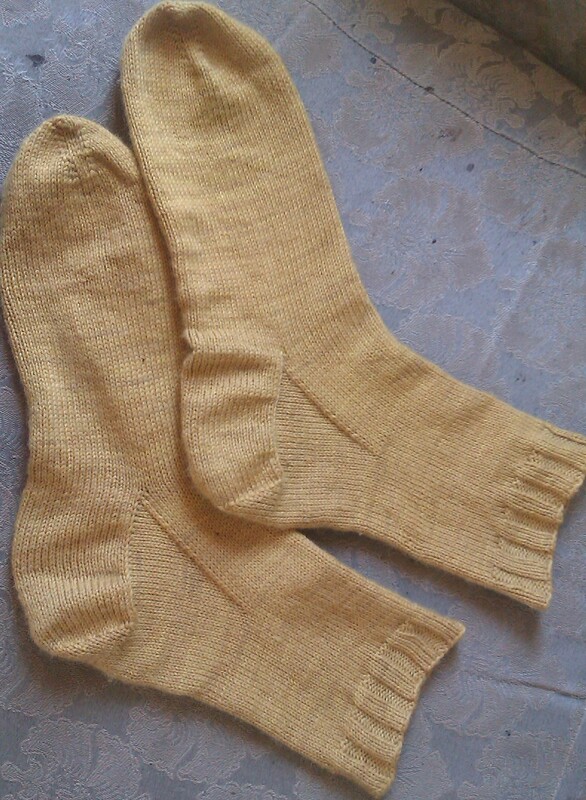 I had started these yellow ones quite some time ago, with the intention of doing some infinity cables on the legs. They had been on the needles too long, and I was having problems wrapping my addled brain around the cables, so I just finished them off plain so I could free up the needles. 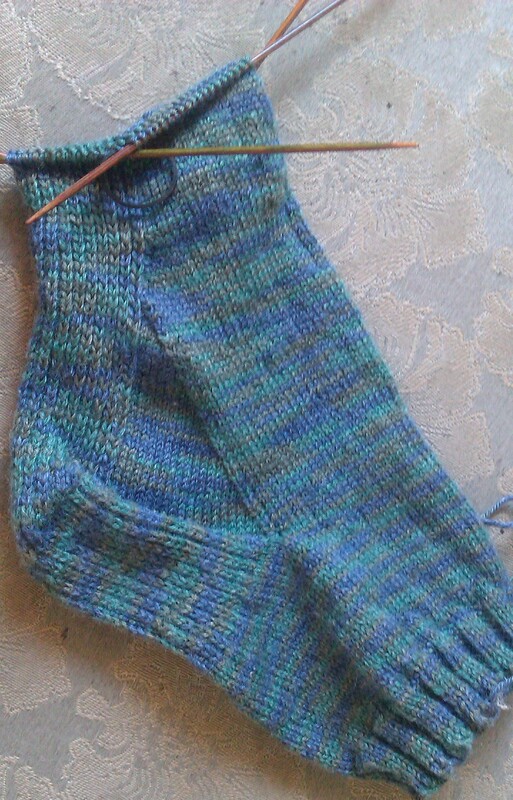 Then I jumped in to knitting a pair off fairly quickly, as barter for my massage therapist. Didn’t get them done in time for her last visit, but she’ll be back soon and I’ll have this pair done. Hopefully I’ll be able to get the yarn she left for me so I can get another pair started too. We haven’t worked out an exchange rate yet, but I need to get to work on Christmas knitting too. I have also found my hand cards. Sweetie had packed a tote that was on the front porch. In his normal fashion, there was not much rhyme or reason to the things in the tote. I found beads, a steak knife, a flashlight, my cards and an assortment of fleece bits. Most of the fleece was toast, but I played with the cards and some of the fleece that I indigo dyed back in late April. 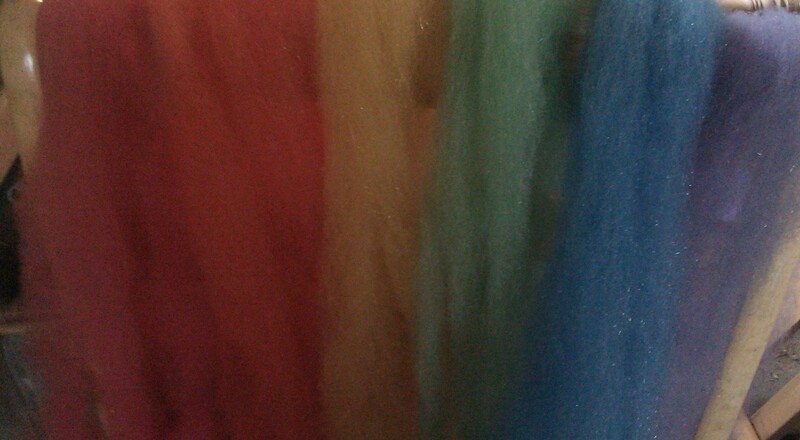 I made up batches that were pure undyed, pure dyed and 3:1 ratios (both directions). 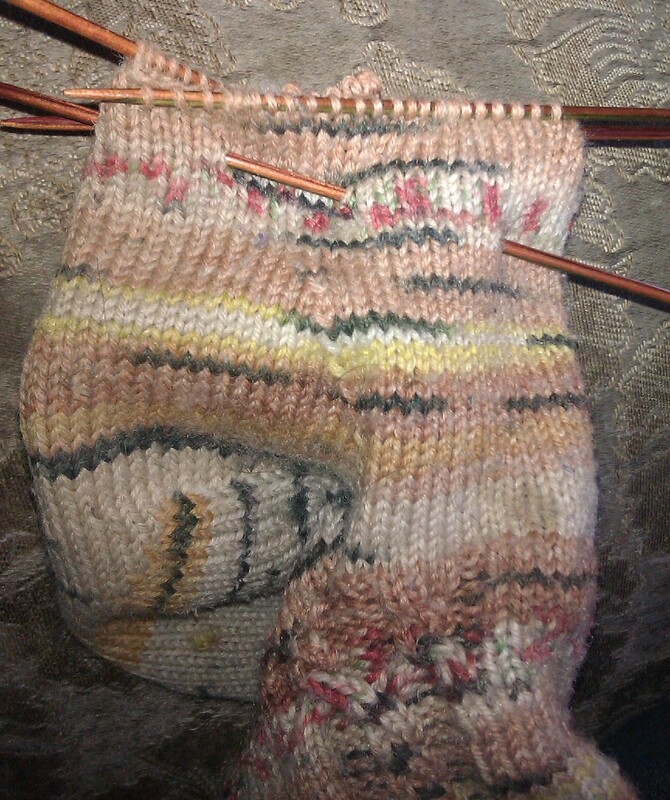 I’m thinking a new hat and matching gloves or mittens might be in order, but I haven’t settled on a pattern yet. I’m toying with the idea of doing some color work, but will see what I finally settle on. I do like to colors, and the progression. The biggest change I’m undergoing right now, I suppose, is self-imposed. Back in late April, I changed my mindset about food. I have had issues with my weight most of my adult life. My weight had held steady for the last 20+ years, within 5 pounds. Didn’t seem to matter what I ate or how I exercised. I’ve always had a fairly good diet. I don’t eat candy, I love fruits and vegetables, I’m just an easy keeper. When I paid attention to how many calories I was taking in, I was holding steady at about 1200 calories a day (most indications are that I should have been losing at least 10 pounds a month at that input). Until the last few years I wasn’t seeing any real negative issues. My cholesterol levels were fine, and my blood pressure was ok, and so I didn’t worry about my weight too much. Then, a couple of years ago, my bp sky rocketed. In early April, it went as high as 170/100. That is not a number I’m comfortable with. While a simple diuretic was able to control it, I now have no insurance and wanted a chemical free way of keeping it down. In April, I moved to a mostly raw food diet. I tried doing a juice fast for 3 days, but my body quickly informed me that I needed protein. So I listened to my body. I juice once or twice a day, I can eat whatever I want (just not all of it). Before I dried Myrtle off (for breeding), I was using raw milk and making raw milk cheese. I’ve cut way back on the amount of carbs (bread, pasta, etc), but if I want them I can have a reasonable serving. So far, I’ve lost about 25 pounds, and more importantly, my blood pressure is back to normal! Even if my weight hadn’t changed at all, it would be worth the effort (little as it is) just to have my blood pressure back where it should be. I don’t feel like I’m dieting, which is huge (as any of you that struggle with your weight will understand). I still eat out occasionally, I’m cooking well. I’m not sure how I managed to reset my mind & my relationship with food, but this is one change I am thankful for. I’m not losing pounds quickly, which is fine since I couldn’t afford to replace my entire wardrobe all at once. But my clothes are fitting a bit better, and I’m getting a few compliments when I’m out in public, which never hurts the ego. Still a long way to go to get back down to what most would consider a “normal” weight, but I’m good with that. I may never get back to “normal”. I am more concentrated on feeling better, on making my body last as long as possible. I would like to enter my 60’s healthier than I am now, with less pain. I’ve got this! 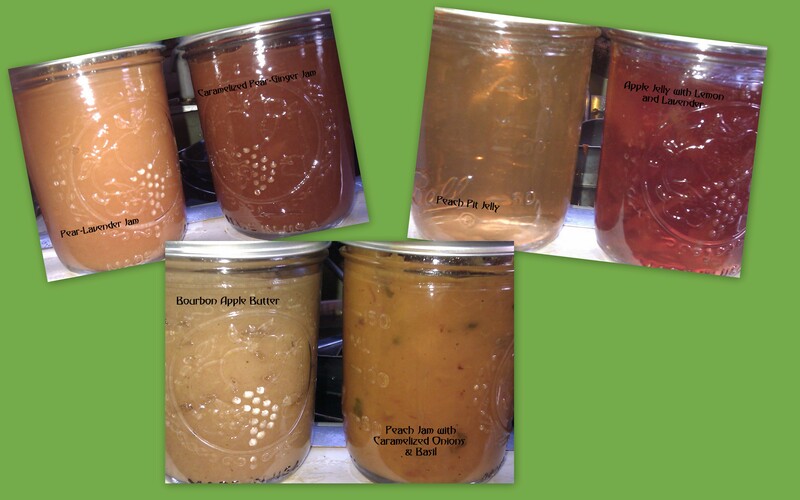 It’s been a while since I did any substantial amount of canning, and I seem to be making up for lost time. Last count was over 50 1/2-pint jars, and I’m not done yet. It started when I saw a flyer at the feed store, announcing that they would be having a box produce sale early this month. The timing was perfect, since I would have a little disposable income from judging at State Fair (more about that later). I came home with a 25 pound bag of onions and a box each of Gravenstein apples, peaches, and Roma tomatoes. The onions are amazing, probably the freshest I’ve ever bought. I caramelized about a dozen of them in one batch. I love having them in the freezer. I store them in small bags, then use them in soups & stews, or add them in to all sorts of other dishes. I’ll do the rest once I catch up with all the canning. 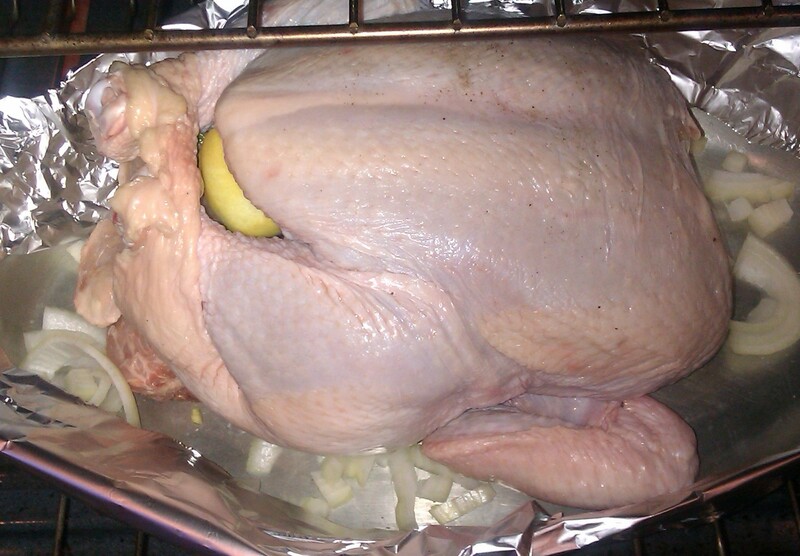 I discovered a wonderful new (to me) blog, http://localkitchenblog.com/. She has a lot of great jam recipes and most are pretty low in sugar, which I really appreciate. Several of the creations coming out of my kitchen right now are either directly from her site, or inspired by things there. First up was a handful of the apples. 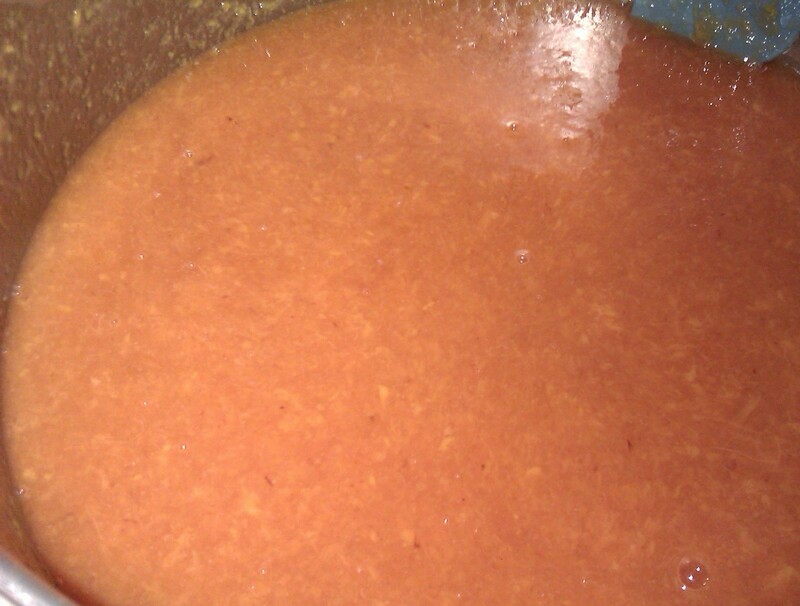 The pulp became Bourbon Apple Butter, and the drained juice became Apple Jelly with Lemon and Lavender. I still want to make applesauce, but the apples will hold for a little while, and the soft fruit was demanding attention. The tomatoes were easy, just peeled and put up in quart jars with a bit of citric acid. On to the peaches. From the Local Kitchen site, I settled on a Peach Jam with Caramelized Onions and Basil. This is more of a savory jam, and I think it will be fantastic on pork or chicken. I’ve made one batch, but I think another is a good idea. I also made a simple Peach Butter, and on the recommendation of my friend Brenda, the pits and skins were made into Peach Pit Jelly. I’m still waiting for that to actually gel, but all the sites say to give it up to 2 weeks before adding more pectin. It’s a very subtle taste, and very pretty. Then the feed store sent out an e-mail saying that any produce left on Sunday was half price. I was really hoping for another box of the apples but they were all gone. Instead, I came home with a box of Bartlett pears. Luckily, Tien Chu mentioned that she was going to be making a Pear-Lavender Jam and she generously shared the recipe with me. My first attempt could have been a fiasco, because I turned on the burner and sat down at the computer. 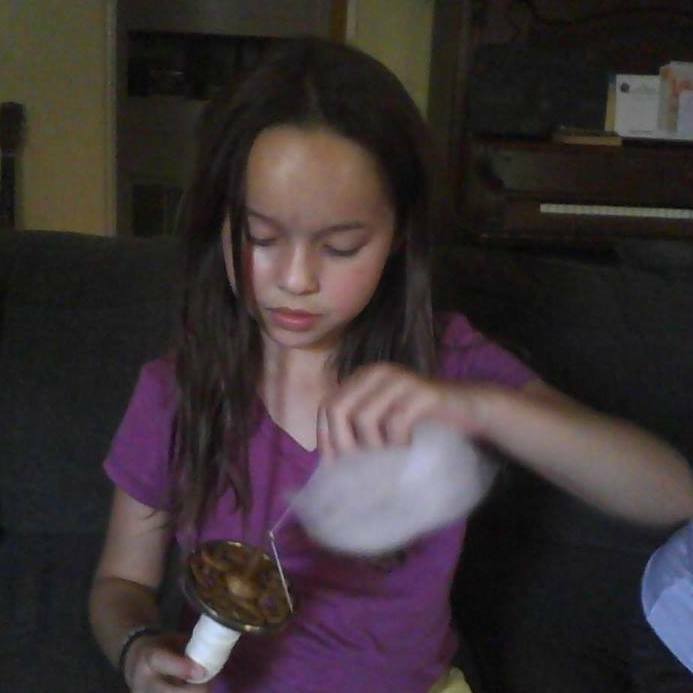 I completely forgot about the pot on the stove until I smelled burning sugar. Oops! It turned into one of my best “mistakes” ever! 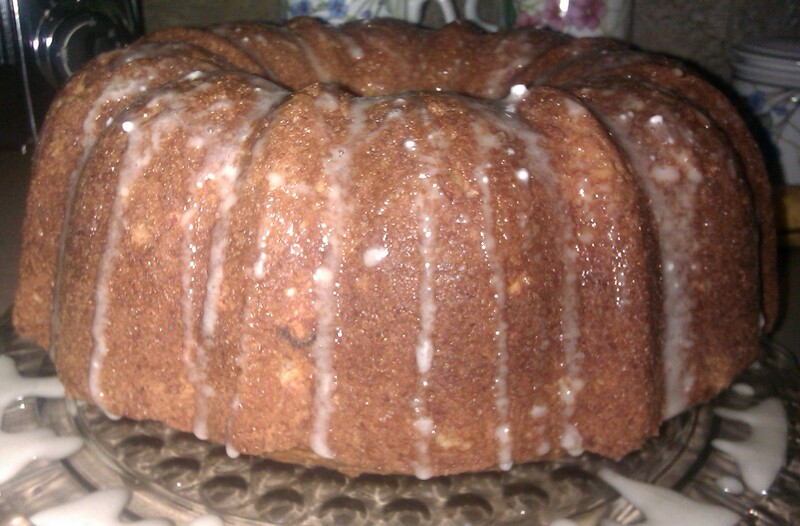 The lavender got lost under the caramel, but it was tasty enough that yesterday I recreated it, using ginger instead. I also made 2 successful batches of the Pear-Lavender. So what about State Fair, you ask? It was a fun experience. Mom came along, since she had never been to the State Fair before. We drove over in the morning, checked in to the hotel and dropped off our luggage, then headed to the Fairgrounds. After a quick lunch, we strolled the grounds, checking out the entries and the commercial booths. We spent a lot of time looking at the orchid exhibit (we have a hard time believing that they are really easy to grow). We were headed over to spend a little time watching the horse show, but got distracted by the big cats and a wonderful reptile exhibit, and then by the birds of prey show. Then it was time for me to report for duty. For their first show, the Angora breeders did themselves proud. Several of the classes put me through my paces, and I tried to incorporate the things I’ve learned as an exhibitor (even if you’ve made up your mind everyone deserves a look, find something positive to say about every animal, and let everyone know why you put the class the way you did) . I won’t be upset if they ask me back next year to judge again. It was a nice couple of days with my mom, and a good introduction to the State Fair for her. Last week I delivered 4 sheep to their new home, 3 of mine and an extra from another local breeder. Meridoc, Manny and Nelson are now enjoying life on the coast with their new owner. It’s always fun seeing the looks I get with a van full of sheep. I even had a Highway Patrol man following me for a while, and when he pulled around me he paused long enough to catch my eye and wave. It surprises me more how many people don’t notice the sheep staring out the windows. The trip also allowed me to have a quick overnight visit with Kid the Younger and see the new apartment, and to treat him and the roomies to dinner out. I wish I could say that I’m totally ready for Oregon Flock & Fiber in 2 weeks, but I’ve been distracted by the fruit. Oh well, hopefully I’ll get my act together this week. We all get caught up in the day-to-day banality of our lives and let the little details slip by unnoticed. It’s one of the things about spending time with little kids that I miss, their ability to be completely absorbed by some minor aspect of life, and it’s something I try to do at least occasionally. I had the opportunity to be reminded about this a couple of times in the last week, and I’m glad I slowed down enough to pay attention. The first detail caught my eye as I rounded the front corner of the house, headed to turning on the hose so I could fill water troughs. The mound of dirt got my attention first, then I noticed the hole. That is my daughter-in-law’s hand for scale. After much reflection, I think a neighbor dog must have done the damage. The cats don’t normally dig like that to go after a rodent, and I have seen no evidence of anything living in or near the hole. Guess I’d better fill it in before I twist an ankle in it. My spinning wheel (a Schacht Matchless) has been having some issues lately. That led to my 2nd little detail. 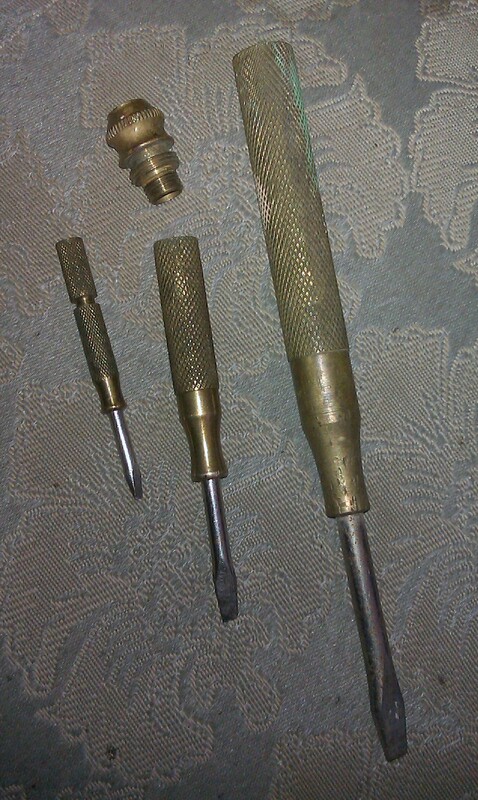 I needed a screwdriver to work with, and grabbed this little brass one that Sweetie’s dad had given me several years ago. I have always enjoyed using it, but never really paid attention to it until this week. 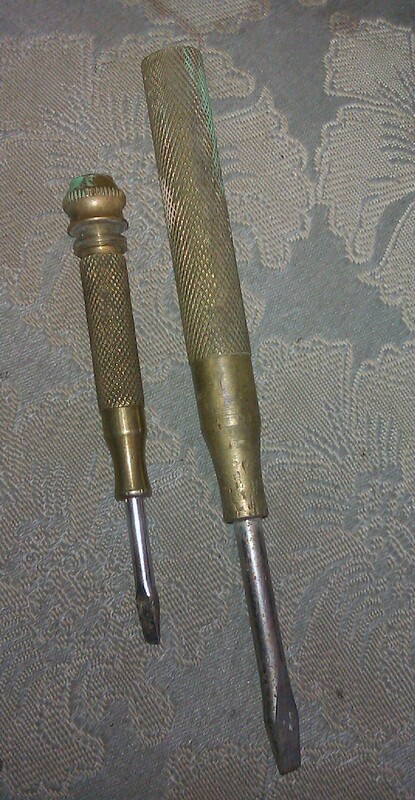 There was a little noise when I used it, a slight rattle. Instead of ignoring it (as I must have in the past), I investigated. And I love what I found. 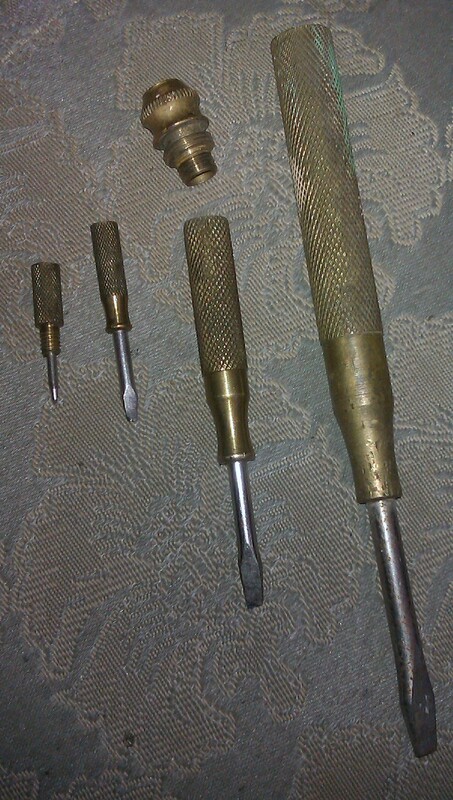 Not one, not two , not three, but four screwdrivers, all nestled together like one of those Russian dolls. I love it! The biggest is about 6 inches long, and the tiny little one is just over an inch. I’ve always loved good tools, and this one just moved up a notch in my favorites list. And with its help and a little TLC, the Matchless is back to behaving beautifully, and I am finishing up the last of the Merlin blend yarn that I started during the Tour de Fleece. 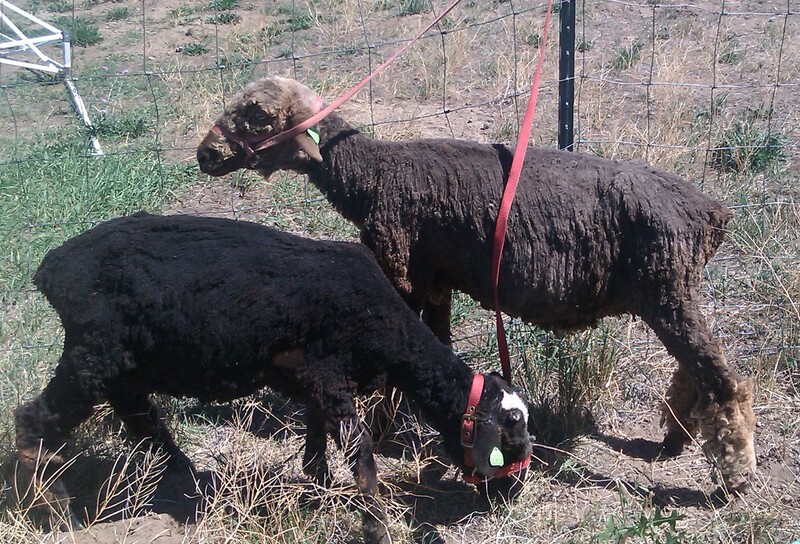 I have gotten a few farm chores done also, including shearing three sheep. Manny and Meriadoc went from shaggy boys to nearly naked. 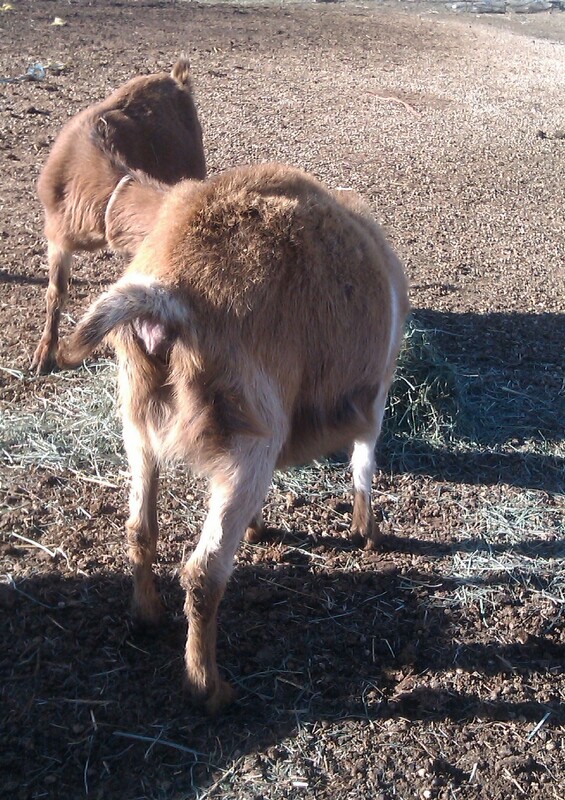 I love their colors, but I still need to really look at their fleeces and assess the quality. I did discover that I messed up when I banded Meriadoc and only caught one of his testicles. This would explain some of his behaviors (very pushy with his pen mates, and occasionally head bashing wood panels). He has never shown any inclination towards being aggressive towards people, so if he stays here I will probably leave things as they are. 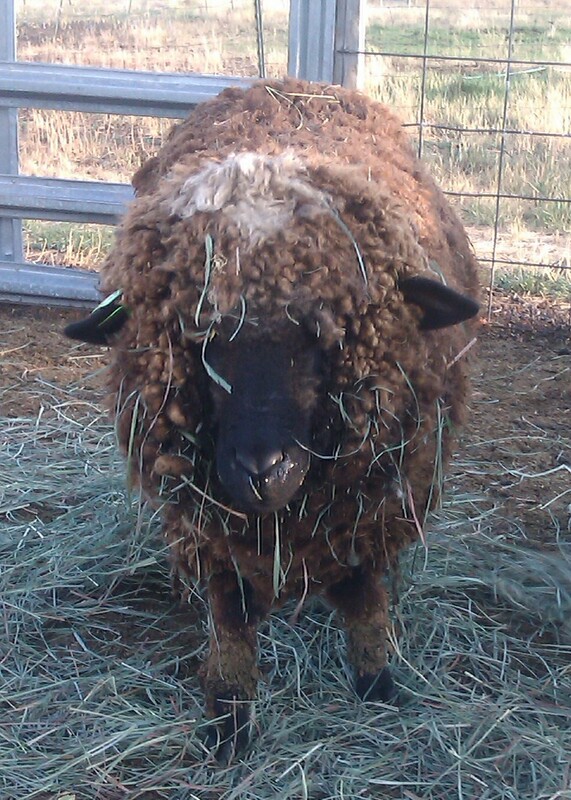 I also sheared the old lady of the flock, Bridget. At 13 years old this spring, she has earned the right to retire, especially since she gave me such a nice replacement ewe lamb this year. I think she looks pretty good for such an aged sheep, and she is now doing “Ashe duty” and getting some grain as a reward. Speaking of Ashe, she is doing well. I am trying to hold her weight steady where it is now (don’t want her getting too fat), and she and Bridget have full run of the barn pen. She is fairly mobile, even if she does look funny getting around. I hope that she will regain some more flexibility in her front legs, for comforts sake, but she seems content. As I’ve said all along, as long as she is willing to keep up the fight, so am I. 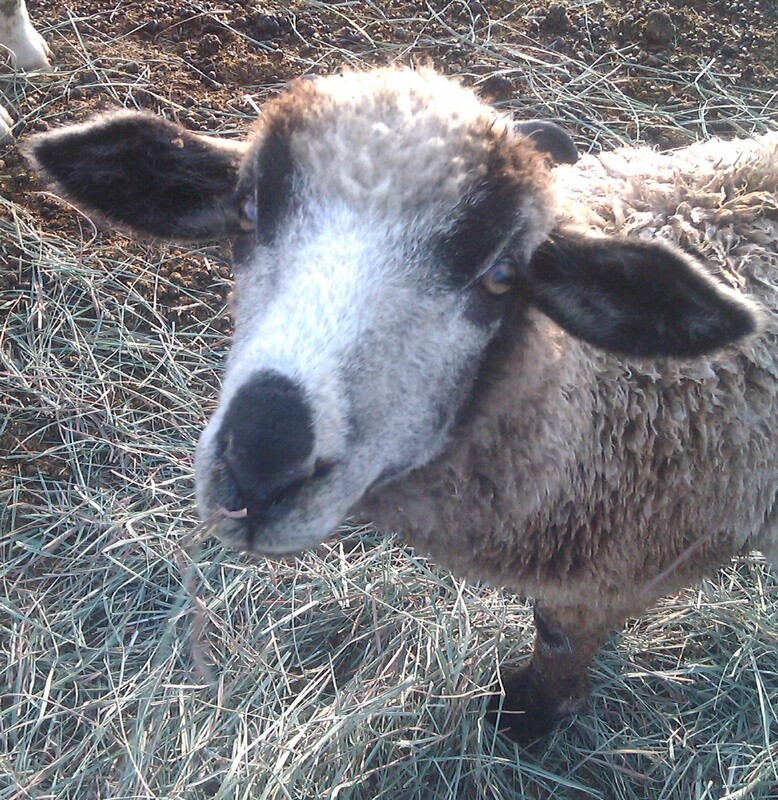 Her lamb, Navid, is doing well also, and is a friendly little guy, always ready for a chin scritch. I am getting ready for State Fair later this week. My mom has never been, and since I will be judging the Angora goats in their inaugural showing this year we are going to make the trip over the mountains together. I have booked a hotel room so that we can relax a bit after seeing all there is to see. Should be fun; I always enjoyed taking the kids to the Fair as an “end of summer” treat. Then next month, we will be enjoying the circus. Ringling Brothers & Barnum & Bailey are coming to our local fairgrounds, so Kid the Younger and Fiancee are coming over to go with mom & me. No word on my missing shawl yet, but the response I have gotten online has been wonderful. My picture has been shared all over the world, so whoever took it will not be able to wear it in public without being spotted. I have made peace with the fact that it is gone, and will dig out the book so I can make myself another one (in a different color so I don’t get accosted wearing it out!). Someone shared how a shawl of theirs made it home 6 months after being taken, so I won’t give up hope, I just won’t waste any energy thinking nasty thoughts about the person who took it. I prefer to fill my life with positive thoughts and actions. Not always possible, but I try. 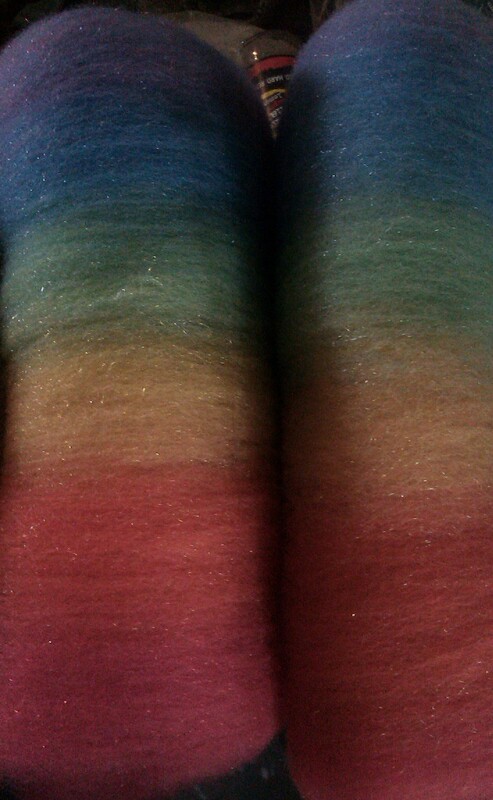 Once again, I’m taking part in Ravelry’s Tour de Fleece. For those of you that don’t know about it, the Tour de Fleece is an opportunity for spinners to concentrate on their craft while the Tour de France is going on. You set your own goals, hopefully set yourself some challenges along the way (on the days the riders are mountain climbing), share pictures of your accomplishments, and have a chance at winning some lovely prizes. This year, I have offered up a prize from my Etsy shop. My goals are pretty ambitious this year. I want to spin enough lace weight yarn from Merlin’s fleece for a spectacular lace shawl (pattern to still be determined). Blend the rest of his fleece with camel, alpaca, and silk (all shades of brown) and spin it up for a sweater. I still need to figure out the percentages, but I figure I will have at least 1 1/2 pounds of this. I am blending another fleece with the last of my own kid mohair and angora from a friend (69.4% CVM/14.4% mohair/16.2% angora). I’ve made the first pass through the carder with this, and plan on at least 2 more passes to blend the colors and fibers as completely as possible. There is a pound of this. It is amazing how much room it takes up at this stage. 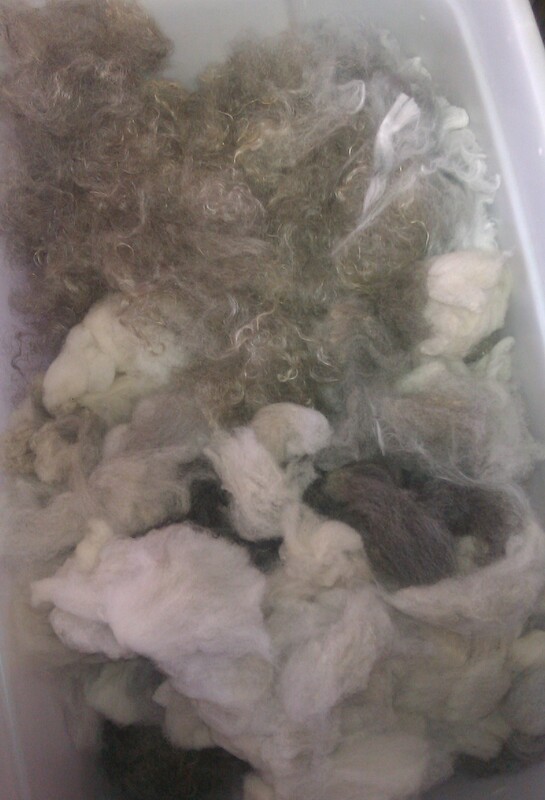 Here you can see the fibers filling the tote (wool at the bottom, kid mohair top left, bunny top right. Once I get the batts finished, I will twist them as I normally do and they will fill a single plastic shopping bag, as will the finished yarn. Air takes up a lot of space! 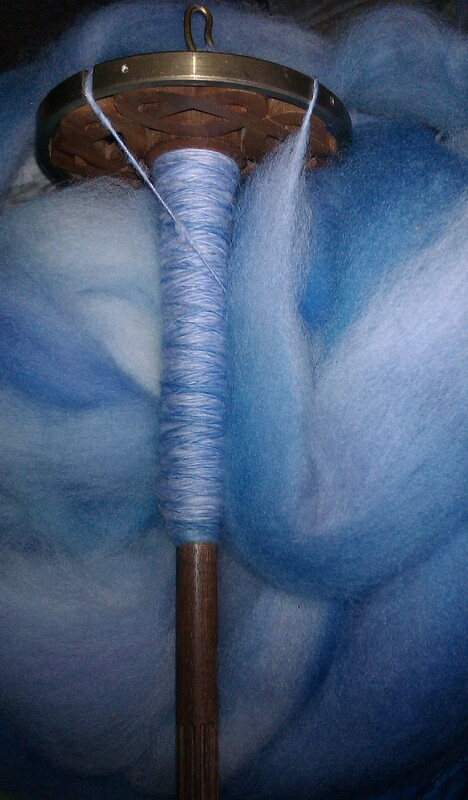 I am finishing up a blue & purple roving I dyed a while back on my Golding spindle. Half is already spun up. The other spindle project is a pink and purple silk cap, also dyed quite some time ago. It has been hanging around in my vendor booth for too long. For my challenge days, I want to create and spin a couple of art batts. I don’t get the appeal of art yarns, but I figure this will be a chance to stretch my boundaries and infuse a little more color into my Tour, which is pretty focused on natural colors. I am also hoping to make some head way on the gossamer merino/silk which has languished on the elec-spinner for way too long. It requires a lot of concentration to maintain the grist of this yarn, since a few extra fibers make such a huge difference when you’re only using about 20. If I get done with all of those, I also have 7 alpaca fleeces that I am spinning on commission. There isn’t a huge rush on those, but they will be paying for my firewood this fall, so that is good incentive to get them finished! I’m still not positive how this woman found me (she was given my e-mail address by a yarn shop a few hundred miles away, in a city I’ve never visited), but I won’t look a gift horse in the mouth. 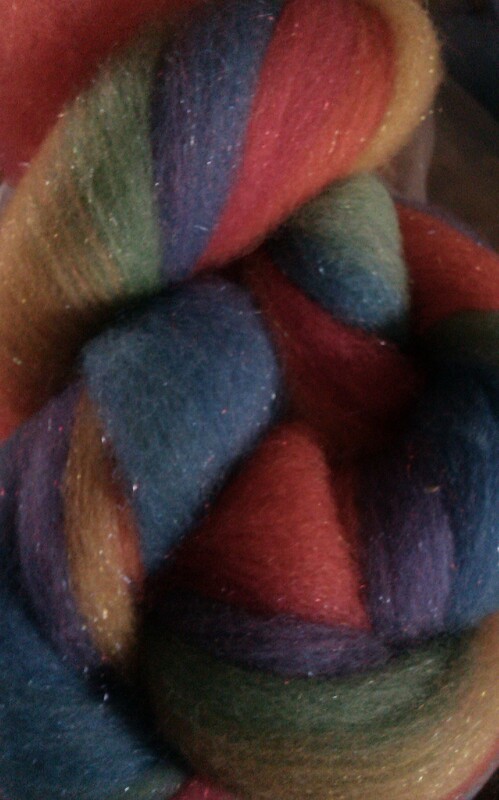 I enjoy commission spinning, once I can help my customer figure out exactly what they want in the way of yarn. Many knitters have no real understanding of the yarns that they work with, and it can be challenging to help them understand the possibilities when you are starting with raw fiber. Alpaca is a lovely fiber, but it has little to no memory, which can make knitting with it problematic. I will be trading out some of her fiber for wool, to give the yarn some recall, and we have discussed adding a bit of silk too. I would love to be able to make a living just spinning. What else is happening, you ask? Well, Kid the Younger is now a college graduate! I am so incredibly proud of his accomplishment. He will be going on to graduate school, but this is a major step. His fiancée has been a huge support for him, and gifted him with a dozen bacon roses and a jar full of “life advice” from several friends and family members, which he read aloud at his graduation party. Many were funny and heart-felt, and he choked up when he got to the one I included from his big sister, “Dance Like No One is Watching”. Black Sheep Gathering was the following weekend, and despite being slower than normal coming out of my annual depressive state (which has ended about the first of June normally, but has drug on a lot longer this year) I managed to attend. If I hadn’t been the contact person for the Spinner’s Lead I might have bailed on the whole idea, but not showing up wasn’t really an option. Over all, I’m glad I went. I had the opportunity to speak with a couple of friends that are also going through things this spring, and I think that helped all of us to feel better. The Spinner’s Lead was a rousing success, and I need to write up an article about it for the next issue of the Black Sheep Newsletter this week. A couple of us will be revising the rules slightly for the future, to try to encourage more people to take part. I need to get to work figuring out my entries for Fairs this summer. I’m still not entirely out of my funk, which makes planning for the summer a bit of a challenge, but I know that I will enjoy it when it happens. Sometimes getting out of my own way is the biggest challenge of all! Not the cheeriest of titles, I know. But this time of year, that is where my mind goes. Tomorrow is the 5th anniversary of my beautiful Daughter’s passing, and in less than a month it will be the 4th anniversary of Sweetie’s passing also. For most folks, spring marks the beginning of things. For me, it marks ends. The passage of time has not made it easier, and I am a mess a lot of the time though I do a decent job of hiding it from most folks. It is also an unfortunate fact that, as a farmer, I have to deal with death more often than most people do. It is simply a part of the life that I have chosen. I know that some people don’t want to think about the more unpleasant parts of my life style, and it won’t hurt my feelings if you choose not to read this post. I promise to get back to happier subjects next time. Some years are worse than others. A few years ago, I grew to dread going out to feed, as it seemed that more often than not there would be a dead animal to deal with. Lambs dropped like flies, it seemed, and ewes too. 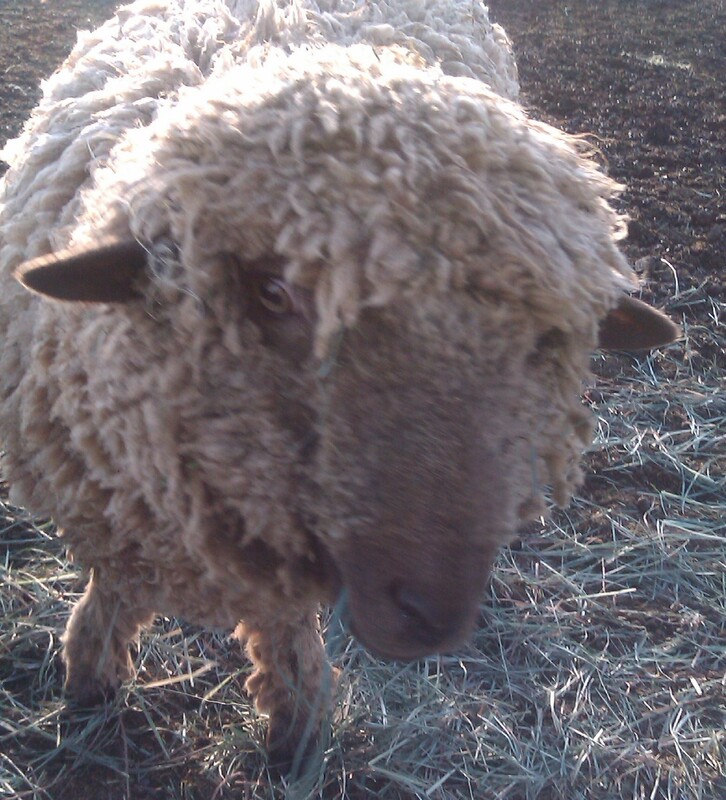 The first picture is Inesh just after I sheared him before breeding season a couple of years ago. He is the father of all of last year’s lambs. Next is Malcolm as a lamb, then Merlin. Since November, I have lost him and my other big ram, Kirk. They had been fussing with each other for a while, and I can only surmise that they caused each other some internal damage since they died within a week of each other. 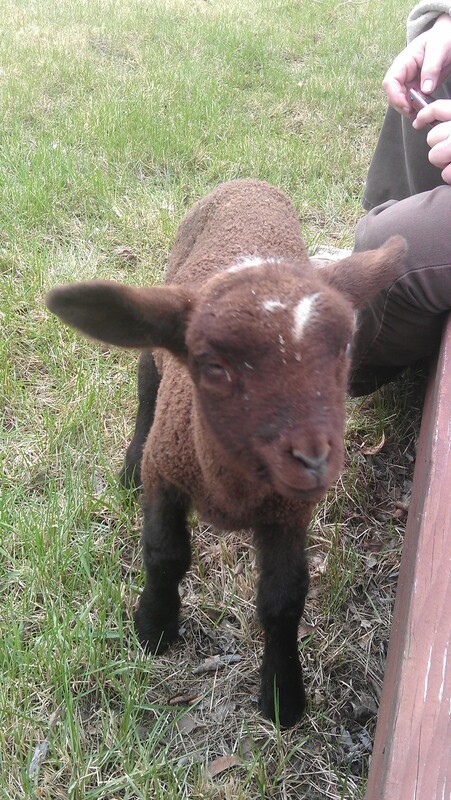 This month, I lost both Merlin (last year’s bottle lamb) and his twin Malcolm. Fine in the morning, dead when I went to feed in the afternoon. In reviewing my books, I have had problems with all of their mother’s lambs. So, what does one do with a dead animal? I have always chosen to treat them with respect. Used to be, they would go into the ground here, with a pile of rocks on top to keep them from being too attractive to the neighborhood dogs. We have quite the graveyard in the back, including Kid the Younger’s horse (thanks to a good-hearted acquaintance with a backhoe). 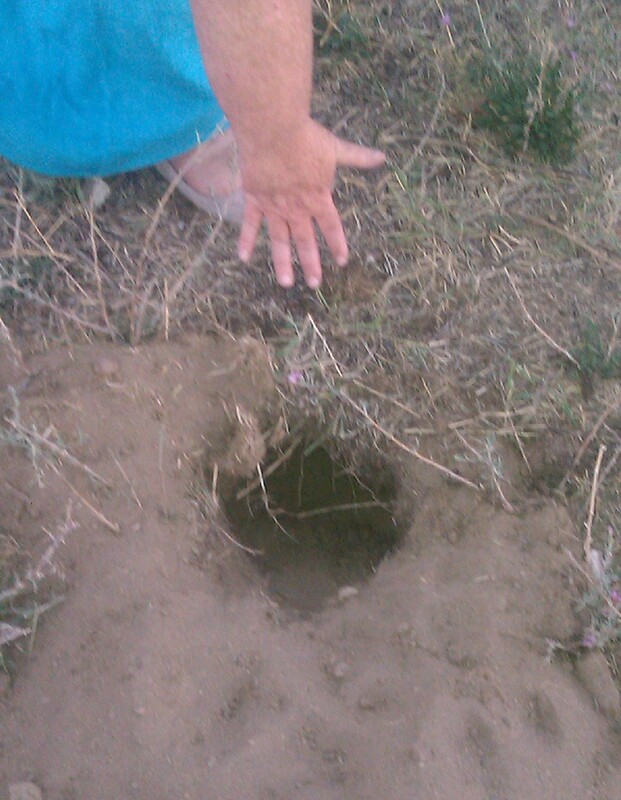 My back, however, no longer makes it easy for me to dig that big a hole. So now I take a drive out to federal land and lay them to rest there. It is a solemn undertaking. No radio, my thoughts centered on the animal in the back of the van, words said in thanks to all they have given me. Their body goes back to nature, and I am always amazed at how quickly that happens. Within a month or less, there is little left but bones and fiber. Most areas do not have an easy, inexpensive way to deal with animals that have passed. There used to be a rendering plant locally, but it closed due to new neighbors complaining about the smells (which were there before they built their fancy houses). 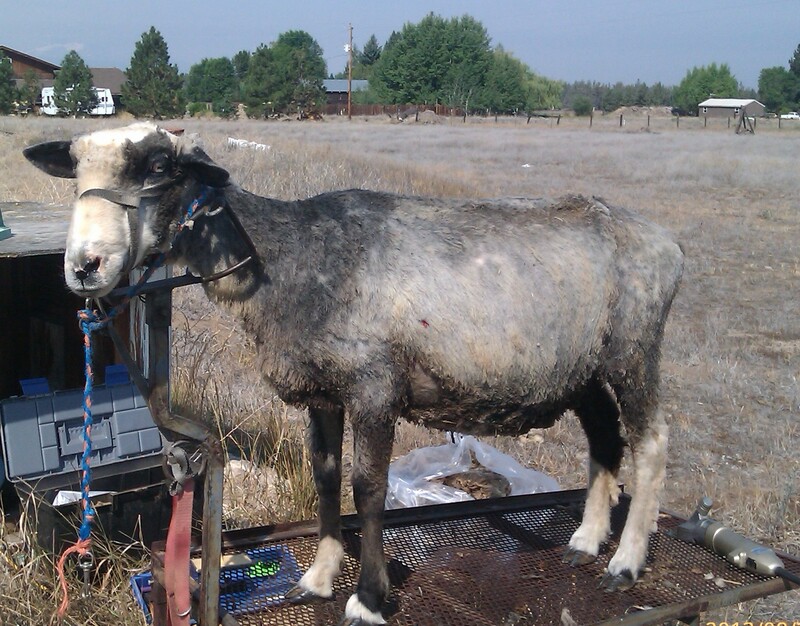 The landfill does not knowingly take livestock. Some friends compost or burn dead animals, some donate them to zoos or places that keep large cats or wolves. It is a fact that all of us have to face, that none living survive forever. I am glad that I am able to honor my animals contributions to my life respectfully. I just hope that I don’t have to do it again soon. On to happier subjects. Fiber Market Day went well and several of the bar code towels went to new homes. Last week, I did a new-to-me show, sharing a booth with Laura at the Small Farm Journal Fair. It is interesting how different things sell at different shows. I sold several of the silk scarves I’d dyed a few years ago, as well as some batts and finished items. We did a lot of demo-ing, and I took Myrtle and Naveed as pr animals. It was a fun show, but being on for 4 days straight was almost more than my poor introvert brain could handle. In addition, on the last day of the show I spent the morning at another venue teaching beginning drop spinning. Sunday I spent recuperating, so exhausted I could barely follow the tv show I was trying to watch. 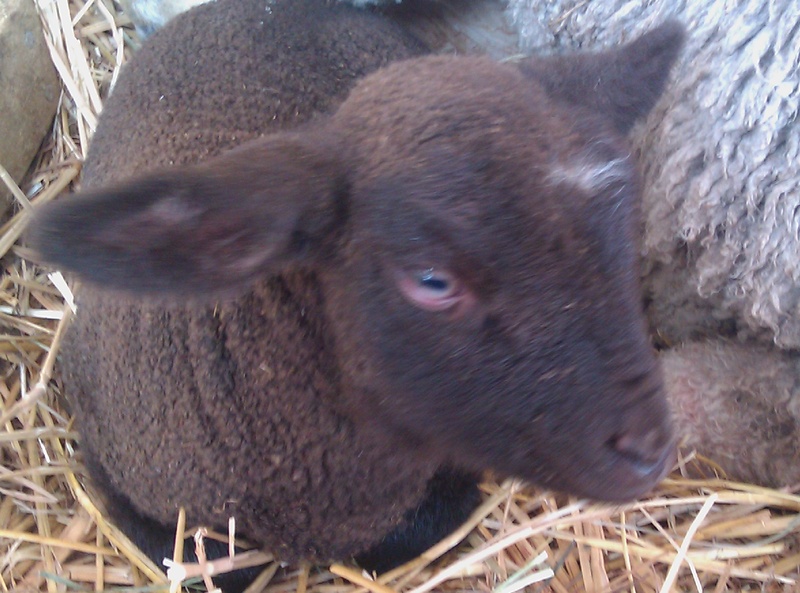 I took advantage of the fact that I would be gone for most of the day during the show to wean the lambs (that way I miss most of the drama and noise). Naveed was the last to get weaned since he was at the show with me. When we got home, Myrtle joined the other 2 goats in with the wethers, while Naveed went back in the main pen with Ashe and the other lambs. 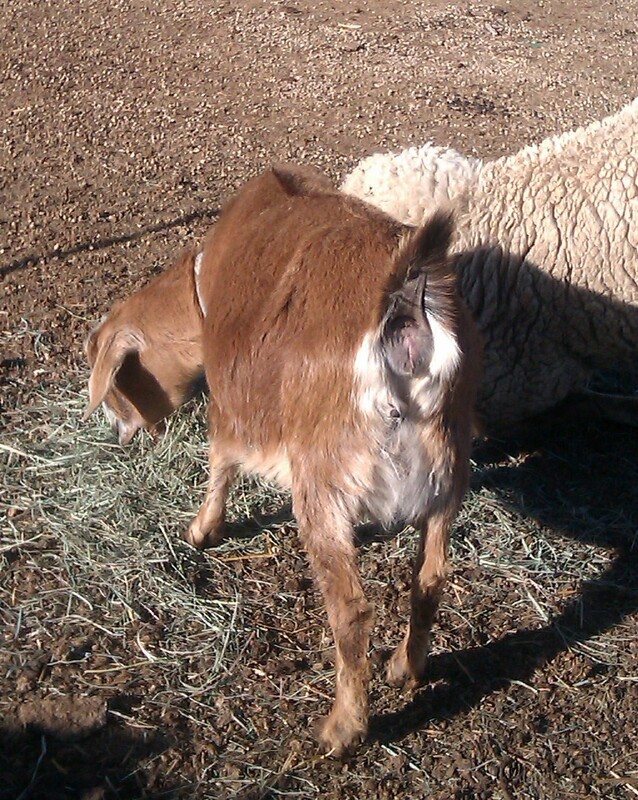 Starting Sunday morning, I have been transitioning Myrtle to a milk goat. It is so nice to have fresh milk for my morning coffee! It has been slow going making the switch, but she gave me 8 ounces yesterday morning and 6 in the evening (as compared to 4 ounces each time the day before). I’ve got a jar of milk in the fridge that I am letting sit for a while to see if I can separate the cream off and make a little butter. Wish me luck! 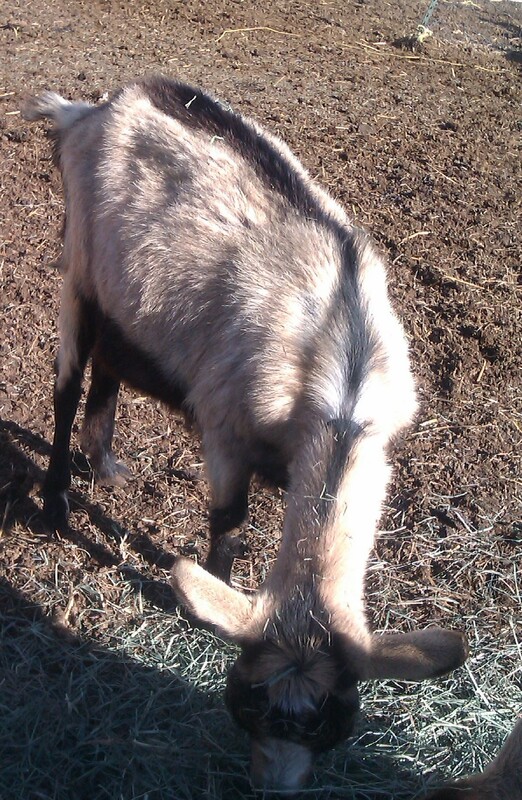 Making cheese will probably have to wait for next year, when I will hopefully be milking all 3 of the goats. All in all, I am very happy with my progress so far. Myrtle has a nice little udder for a first timer, and I am keeping my fingers crossed for Clara and Cloe. Ashe is doing well, working really hard at getting up. 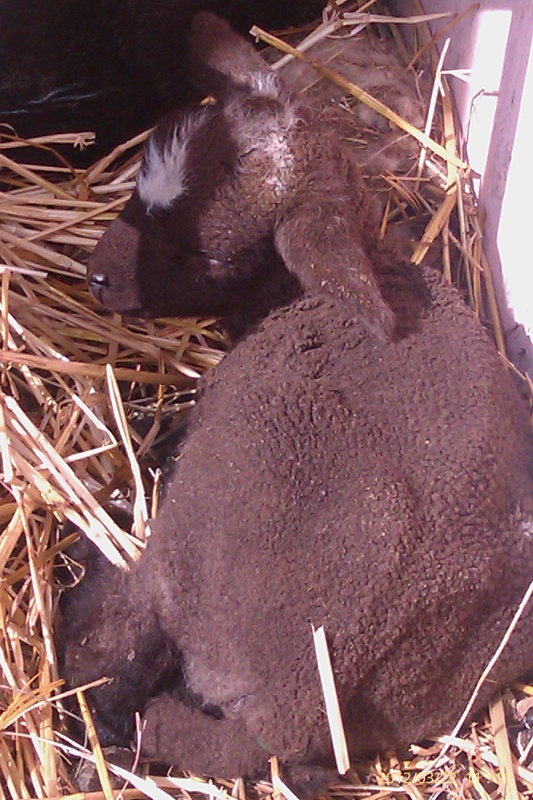 I opened up the barn now that it’s just her and the lambs, and she gets herself outside to enjoy the sun. She still can’t straighten her front legs all the way, so she looks strange, but she can get herself a drink of water on her own and her spirit is unbelievable. She is putting on weight and eating like a horse. Even if she never recovers completely she is an inspiration, and she will be auntie to the lambs as long as she chooses to stick around. Next up on my to-do list is getting all the stuff I didn’t sell listed on Etsy, so keep checking back there if you are interested in any of the bar code towels, batts or hand-dyed top & yarn.